This is the BEST Chocolate Chip Cookie Recipe and the only basic cookie recipe you need, seriously. This ONE cookie recipe makes tons of other recipes and is SO GOOD. Chocolate Chip Cookies: when you find a good one, it’s the unicorn of dessert recipes. There are so many recipes out there and I’m not gonna lie: most of them are meh. Some of them are okay. Some of them are not very good at all. Some of them a great…but not OMG! And the rest are just…meh. 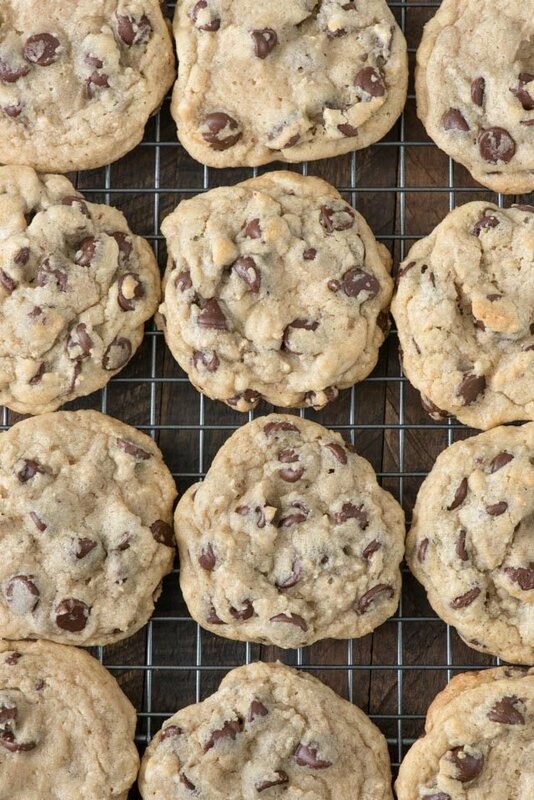 THIS chocolate chip cookie recipe is the only one (of two) that you need. It’s soft and chewy, full of chocolate, with depth of flavor. They’re easy to make with no weird ingredients and you can change up the recipe to make any kind of cookie recipe you want. I know, I know. I already have a BOMB-DIGGITTY chocolate chip cookie recipe. I do. It’s a copycat of that Doubletree recipe everyone loves and believe me, that recipe is TOP NOTCH. But it’s not a…regular chocolate chip cookie. Basic recipes that aren’t at all basic; these are the blueprint for a million other recipes. These chocolate chip cookies are #3: they’re just a basic recipe. And that’s okay, because basic recipes taste amazing (ahem: soft AND chewy sugar cookies) but they can also be turned into SO MANY other recipes. For years I’ve been making a version of this cookie recipe. I’ve changed it here and there, to make Kit Kat Cookies or Chocolate Chip Cookie Gooey Bars. I’ve added Reese’s Pieces to them and stuffed them with peanut butter cups. 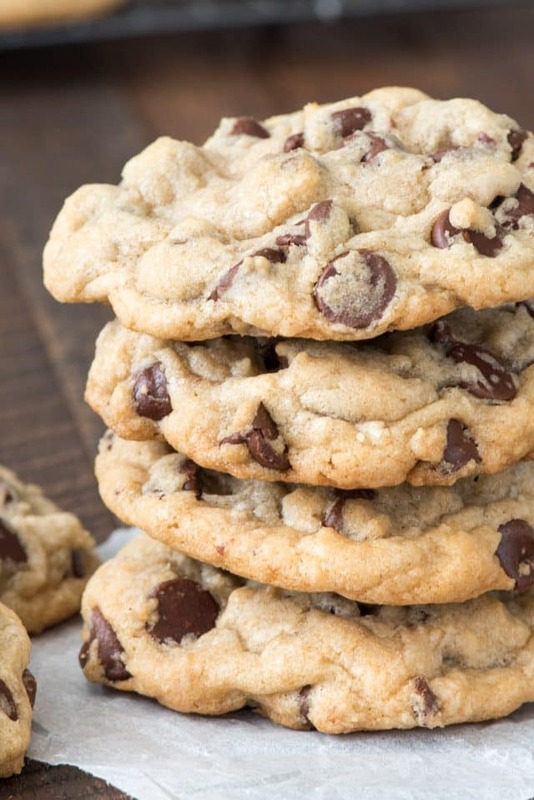 The BEST Chocolate Chip Cookies recipe that you’ll make over and over for years to come! Let’s talk about cookie science and break down all the components of this recipe. What kind of butter makes the best chocolate chip cookies? I use unsalted butter in all my cookie recipes, unless otherwise specified. I like being able to control the amount of salt added. But you can also use salted butter, just cut down on the added salt. The rule of thumb is 1/2 cup salted butter = 1/4 teaspoon salt. So, in this recipe, if you’re using salted butter, reduce the salt by 1/4 teaspoon. Here’s the most important thing: use MELTED butter in these cookies. Melted butter, when combined with the sugars, makes a toffee-like flavor. Plus, I think it adds a depth of flavor and also adds to the texture of the cookie. What kind of flour do you use in a chocolate chip cookie? This recipe uses all-purpose flour. For the best results, use that. If you’re trying to substitute gluten-free flour, it will change the texture of the cookie. I’ve substituted that flour in many recipes with success, but not in cookies. Do I have to chill the dough? Allows the butter to solidify again, ensuring your cookies don’t spread too thin. Allows for a chewier outside AND soft inside. Allows the flavors to develop as they sit. Don’t skip chilling. Just don’t. Pro tip: scoop the cookie dough balls BEFORE chilling. The dough is easier to scoop that way! What kind of chocolate makes the best chocolate chip cookies? Use a good chocolate chip, okay? Stop buying the store brand, unless it’s Trader Joe’s. Trader Joe’s chocolate chips are by far my favorite, with Guittard or Guiradelli being a close second and third. Mini chocolate chips make every bite chocolatey. You can also mix up the chips: use some white, some milk, some dark. Do what you like most! And…if you like peanut butter…be sure to get the recipe for my PEANUT BUTTER CHOCOLATE CHIP COOKIES! These cookies are perfect from the oven or perfect cooled to room temperature. They store easily, ship easily, and freeze well. Good luck just eating one! The BEST Chocolate Chip Cookie recipe is easy to make and a great base for so many other cookie recipes! Love chocolate chip cookies? Be sure to try Trish’s Chocolate Chip Cookie Cheesecake Bars, Cheryl’s Chocolate Chip Cookie Layered Delight, or Karen’s Oatmeal Chocolate Chip Cookies. 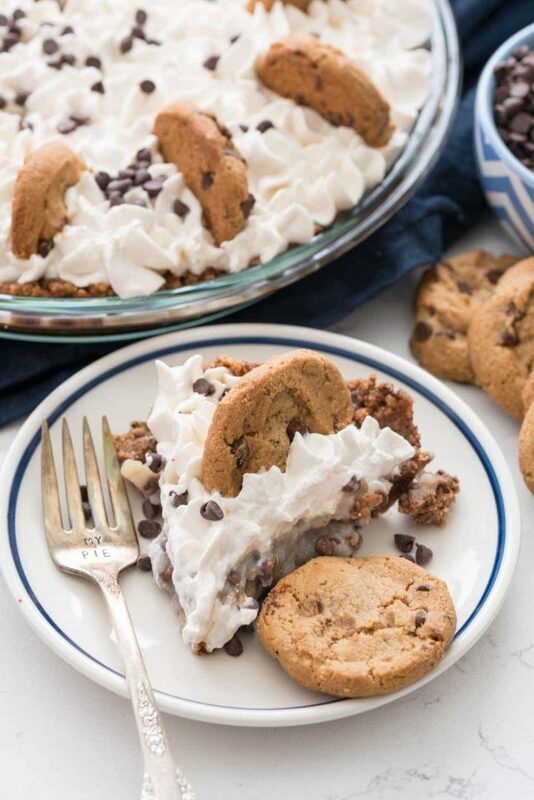 Chocolate Chip Cookie Pie is a good way to use up your cookies! 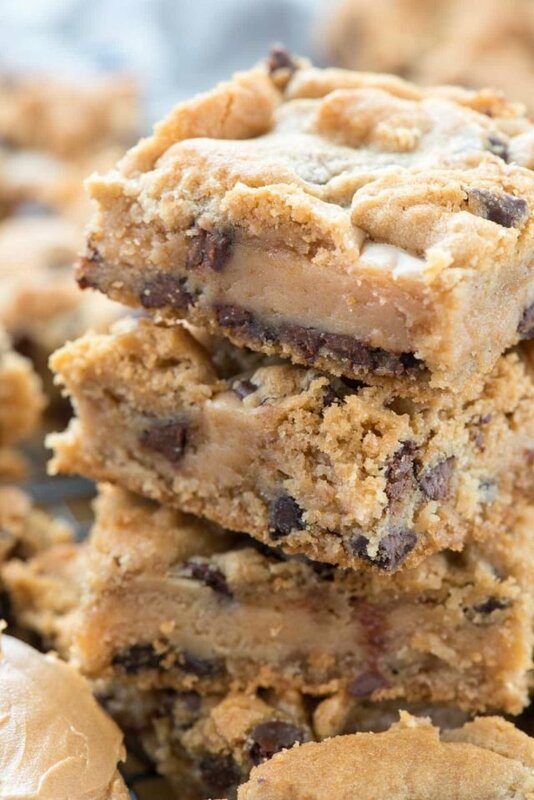 Peanut Butter Stuffed Chocolate Chip Cookie Bars take cookies to a whole new level! 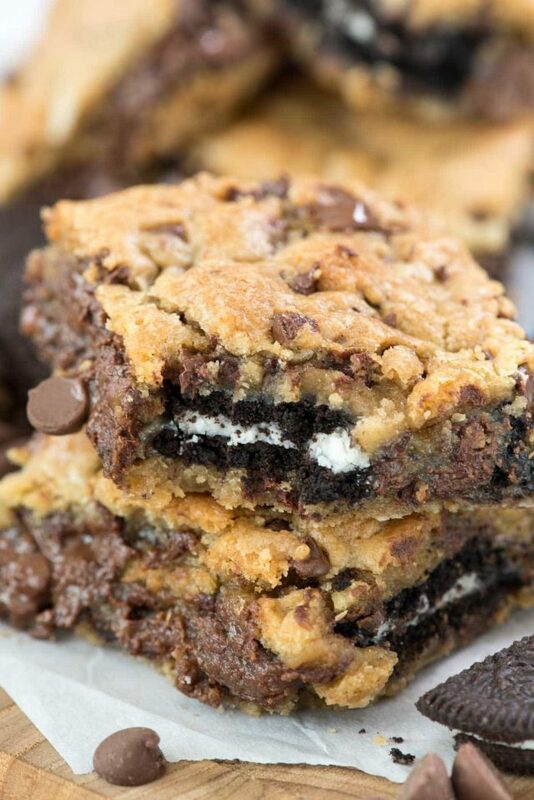 Oreo Stuffed Chocolate Chip Gooey Bars have OREOS inside! I liked this recipe, but it did NOT make 24 cookies. Mine only made 11. i used 1/2 cup less of the chocolate chips that it called for, but even if i had used all of the chips I could still tell it wouldn’t have made twenty-four. I used 2-tbsp scoops like the recipe said, so I’m not sure why this problem occurred… anyone else? I did something wrong, my cookies didnt flattened and spread. And i only got 14 cookies out of it. They taste is pretty good but they not soft like i thought they’d be. I doubled the amounts for the dough and kept the amount of choc. chips the same. I portioned them out to be heaping table spoons (about 1.5 inch balls) and got closer to 24 cookies. I froze the dough ball sin advance, and thawed them in the fridge for 24 hrs before baking. I also let them sit on the cookie sheet as the oven was pre-heating. I have two ovens and baking time varied from 10-14mins. I just baked them until they were a little brown around the edges, on the rack toward the upper third of the oven so that the tops would cook a bit faster (getting very slightly browned). You want these to be very soft when you take them out of the oven. Don’t let them get too brown. They harden as they sit (several mins on the pan and then on a cooling rack). I was selling them at a church bake sale the next day, and they turned out crispy on the edges and outside yet still soft in the middle. Delicious. Pros: convenience of starting with melted butter, scooping & chilling the dough to bake when time permits, pretty good flavor. Didn’t have any issues with the yield (used the small Pampered Chef cookie scoop). Con: really expected a more awesome tasting cookie. After the first couple batches were baked I thought they were almost bland (!). Like another review I read, I added salt by dipping the top of the dough balls into kosher salt and was much happier with the flavor. This is a recipe worth keeping and I’ll certainly make these again. But next time will add 1/4 to 1/2 t more salt to the dough, and may still put kosher salt or sea salt flakes on top. I’ve always had a hard time with chocolate chip cookies. They usually spread out too thin and are too crispy. These are PERFECT! I’ve made them 3 times now. And they came out perfect every time. My new go-to recipe for sure. 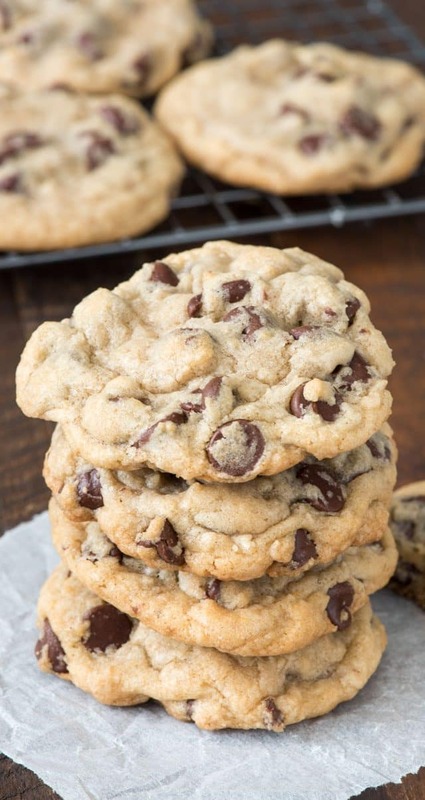 I have always had a hard time with Chocolate chip cookies ……I’m looking forward to making these! I made these for a friends birthday at school. It was super easy and they tasted delicious, while still being easy to take with me and fit in my locker. My friends loved these! I would say it’s a great recipe, but I don’t know if i’m going to make it again. It was kind of small, and while I can just double it, most recipes already have that which would be way easier. I followed the video and directions word for word, however, the outcome was a dry and crumbly cookie…maybe it was me or maybe something was left out of the directions. i have the same thing sometimes. Turns out its my stupid ovens fault…you see, the heat rises from the bottom so my pastries look SO GOOD and then whichever pan was on the bottom is completely BURNT!!! I use a pizza stone to help even out the heat, and halfway through time i switch the top and bottom. Don’t give up on this recipe! It’s delicious when it’s done the right way. I had been trying different chocolate chip cookie recipes and when I found this one it was my favorite! I made them twice exactly as the recipe called and they were amazing! But the third time I made them I was out of unsalted butter. I used Country Crock original (salted) butter and left out the half teaspoon of salt. The dough was very runny unlike the first two times I made them. I’m wondering if this is because of the salted butter I used. Any thoughts? Thanks for the recipe! I used salted butter in mine and reduced the salt and they came out perfect. I could totally be wrong but country crock is usually margarine not butter. It has a lot more water and tends to make dough runny and cookies flat. If it is butter I apologize. I’ve never noticed it being real butter before. Forgot to give 5 stars on my last reply! My new favorite chocolate chip cookie recipe! Video shows using two eggs written recipe says one egg. Which is it?